For Folk's Sake - what a weekend! Well... what a weekend. MAPS was a busy, manic, wonderful success. Our For Folk's Sake night attracted a scarily huge crowd who massively enjoyed our performers - and many have since requested that it be a regular night! You never know - maybe it could be?! Watch this space! So an enormous thank you to our performers, the staff at Cup, the audience and the lovely folk at MAPS. Maybe we'll do it again some time! 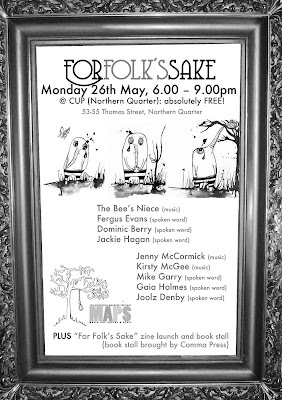 If you weren't at the event and didn't get a copy of the latest issue of For Folk's Sake, let me know and I'll get one to you. Ooh, and there's plenty of delightful badges going, too! Right, I'm off to rest, then go violin shopping then Wychwood! Phew! And, delightfully, kindly Kate the editor included my event on Monday at Cup as one of her things to do over the weekend. Excellent! Thanks, Kate. For Folk's Sake - It's MAPS festival! And only a week to go! Manchester's Fugitive Motel collective are well known in the area and beyond for their humorous and witty responses to music - and now I've joined them! The Motel can be found here: http://www.thefugitivemotel.org.uk/ so look out for my ramblings on there from now on! She's possibly the only person playing traditional Scots tunes on a Hardanger fiddle, and is lovely to boot. She's in a Norwegian-influenced band called Fribo who are currently thinking about a new album - so look out for them shortly!